A massive march in support of Scottish independence has seen thousands of people pack the length of Edinburgh’s Royal Mile. 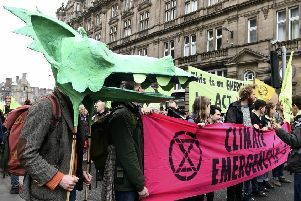 The All Under One Banner event began near Edinburgh Castle at 1pm on Saturday before making its way down the famous thoroughfare towards Holyrood Park. Conservative estimates put the attendance in the tens of thousands, although there has been no official confirmation. Linda Hamilton, from Glasgow, was one of those who took part. A small number of union-supporting counter protesters were on the Royal Mile as the pro-independence crowds walked past. They shouted they are proud to be “Scottish and British”. Police Scotland said there had been no reports of any disturbances. Independence supporter Iona Young, 20, from Dunfermline, claimed the contrast in numbers for each side showed their togetherness. Scotland in Union chief executive Pamela Nash said: “Poll after poll shows that a majority of Scots don’t want a divisive and unnecessary second independence referendum. “Those marching in Edinburgh are not representative of Scotland, and they are talking to nobody but themselves. The organisers should also be ashamed of the way they have attacked Historic Environment Scotland staff for doing their job. Bands, bikers, people in fancy dress and countless Saltire flags were all part of the march towards Holyrood. Those who gathered in the park listened to speeches and live music performances. Others scaled Arthur’s Seat to get a better view of the event. It comes despite Historic Environment Scotland - which looks after the green space - saying the rally had not been given permission to take place. A spokesman for the Scottish Government body said: “Our position on use of the park for any rally after the march remains the same. It has not been overruled by Police Scotland. “To confirm, we have not given permission for the set-up of stalls, staging, branding and other static presence within Holyrood Park. Early estimates suggest that up to 50,000 people could attend today’s march and rally. But full figures will be supplied by Police Scotland after the end of the march.